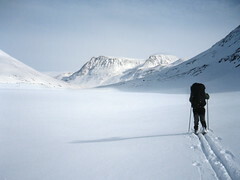 With limited cross-country skiing experience (2 of us had never used them before setting off at the start of the trek), the learning curve was steep, and a lot of research had to happen in the pre-trip planning to maximise both our fun and the chances of staying alive should something go wrong. Even something as fundamental as finding the right type of skis proved a little tricky; with choices between cross-country, back-country, randonee, telemark and all the variations thereof [brief overview here] to be made, decision supporting information was a little thin on the ground, as were UK suppliers of any of the above. Two of the group had flown to Oslo for a weekend for the express purpose of buying skis, but the rest of us found a saviour in the form of a retired gent who runs Euroski Ltd from his house near Brighton. His pragmatic attitude and line in entry-level skis was just what we needed (although his young helper's overdrilling of the pilot holes when screwing my bindings in place caused much frustration when they failed later). Now kitted out with light-weight cross-country skis (Atomic Mover 20) and soft trekking boots (Alpina ST40), the first hurdle was well and truly passed. 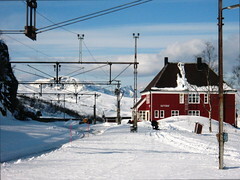 The plan for over-nighting was to use basic mountain huts run by the Norwegian Trekking Association (the DNT). 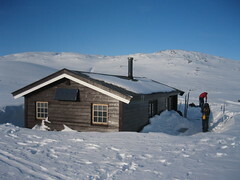 With no running water or electricity, these huts provide a wood-burning stove for warmth and melting snow, a gas hob for cooking, and ~8-20 bunks depending on size. However, with temperatures dropping as low as -20C at night, we needed a backup should we fail to make it to a hut due to, say, injury or bad weather conditions. The obvious choice was digging a snow hole large enough for us to sleep in, so shovels, thick down sleeping bags and waterproof bivvi bags were added to the kit list. By melting snow at the huts, we had hydration covered (although our Camelbaks freezing up was problematic), so we took only dried food to minimise weight. With each person carrying their own supplies, this was a key area to shed some unnecessary pounds, but the "food-fear" of running out prematurely was alive in our minds! Couscous or spaghetti with cuppa-soup as sauce and chopped chorizo was the standard high-carb evening meal, and porridge fuelled us up in the mornings. We aimed to load up on calories (peanuts, raisins, choclate) every 90 mins or so when skiing, so lunch was distinguished only by breaking out a flask of more cuppa-soup. With such a limited diet, our first 'proper' meal (okay, a burger in a mall) on returning after a week in the wilderness was sweet! On hitting the trailhead at Katterat station on the first day, we had between 16kg and 21kg of kit and food in our bags, and it was time to learn to cross-country ski in a very top-heavy state. The first (admittedly hilly) kilometre took us about 2 hours, which was concerning since our longest day was 21km! 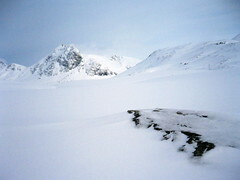 However, we quickly got a feel for at least moving forward on the flat and (very) gentle gradients, and made good time for our half-day ski to the first hut, Hunddalshytte at Hunddalen. Our planned route, see maps below, would only take 4.5 days (Katterat - Hunddalshytte (Hunddalen) - Cunojavri - Losistua - Hunddalshytte (Hunddalen) - Katterat) assuming everything went smoothly, so we had 2 days of contingency built in for unforeseen eventualities. As it turned out, the weather was in our favour, and we made good progress on the first three days, with navigation made simple by the clear views of the terrain. Had visibility reduced, following compass bearings would have been order of the day. We had done some notional fitness training in the form of a half marathon before we left the UK, but these early days were hard work, and prolonged climbs were absolutely exhausting. Beyond a certain gradient, ~10 degrees, our skis would slip back downhill as we tried to climb, so we had to 'herringbone' our way up. Herringboning in fresh snow is insanely hard work -- your skis must stick out as widely as you can twist your legs (think Charlie Chaplin), and the tips invariably dig into the powder and resist all attempts to then lift your foot back out again. So the uphills did tend to take a while conquer! But all the hard work was entirely justified by the sense of adventure and the beautiful scenery. We didn't see another living thing for 4 days after the trail from Katterat and the views all around were stunning. It was difficult to grasp just how isolated we were since the horizon was always made up of the mountains next to us, but I was glad we didn't need to contact the outside world as it would have taken a long time! Towards the end of our week on our return to Hunddalen we met a few other groups of skiers. Exchanging experiences, our choice of touring / back-country skis was much less popular than the randonee ski and boot option. Randonee boots are harder, more like downhill ski boots, and are used on shorted, broader skis with a clip on the binding to lock the back of the boot to the ski. This setup is less comfortable for long treks, but means the skier can tackle much steeper descents in more of a downhill style. Our conclusion was that next year we'll be taking randonee skis with skins, aiming for summits, and very much enjoying downhill fruits of our labour. We spent the spare 'contingency' day at the end of the week on an outing from Hunddalen without backpacks. A couple of hours ski up to Basejavri glacier lake was bliss without bags, and the view down to the sea at Rombakbotn fjord served as a great finale to the trip. Check out our kit list of food, clothing and equipment.